We have a family tradition of going to the pumpkin patch each year and picking out pumpkins for carving. This year the weather was too wet so the selection of pumpkins was not very good. Most of them were rotten. We picked out a few good ones for decoration on our front porch, then later I picked up a few pumpkins for carving at Walmart. 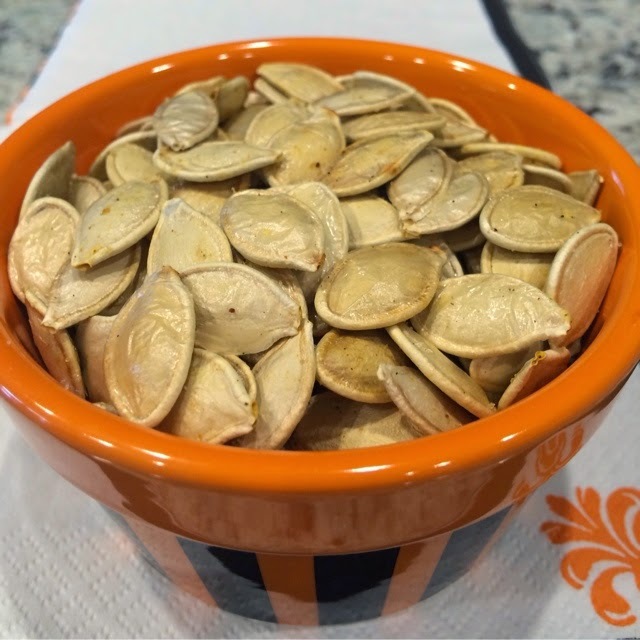 Once the pumpkins were gutted and carved, we took the seeds, rinsed them off, and roasted them for snacking on throughout the week. It is super easy to do. The hardest part is getting the guts off the seeds. Once the seeds are rinsed, spread them out on a cookie sheet or pan, spritz with a little oil, and season with your choice of seasonings. Sometimes all I use is a little salt, but this year I used seasoned salt for a little extra zing. They were delicious! Once they are seasoned, roast them in the oven at 300º for about 45 minutes. Our batch never lasts more than a couple of days, but we keep them stored in an airtight container. Enjoy!